White Gazpacho 225 2 lb raw almonds, 2 cloves garlic, 4 1/2 in slices country bread, 6 c water, 1/2 t salt, 1 c olive oil, 1/4 c sherry vinegar, 1/4 c lemon juice Red gazpacho garnish: 2 c cherry tomatoes chopped, 2 c red grapes chopped, 1 cucumber chopped, 2T olive oil, 1 T sherry vinegar, 1/4 t salt, ground pepper, 1/4 c chopped mint Boil almonds and garlic 2 min. Remove skins from almonds. Blend all. Chill 3-4 hours. Blend garnish and serve on white gazpacho. 2T plus 1/4 c olive oil or rendered chicken or duck fat, 1 bunch young carrots split lengthwise, 2 onions in quarters, 1 bunch kale, 1 qt rich chicken stock, 2 eggs, red wine vinegar, whole wheat croutons. saute onions and carrot in the 2 T fat until caramelized. add kale and stock, boil, simmer 10 min. fry eggs in 1/4 c fat, spooning fat over as they cook. season with salt, pepper, vinegar. set croutons and vegetables in bowls, pout hot stock over, top with eggs. Basic Method 48 1)	Leaven: night before, mix 1 T starter with 200g warm water, 100g whole wheat flour, 100g flour 2)	Mix leaven with water. 3)	Then add rest of dough ingredients without salt. Rest 25-40 min, which allows the protein and starch to absorb water and then relax into a cohesive mass. 4)	Bulk fermentation: Add salt and more water. Fold the dough on top of itself, transfer to a container. Ferment 3-4 hours. 5)	Turns (during bulk fermentation, instead of kneading). Dip hand in water, grab underside of dough, stretch up and fold over rest of dough, repeat two or three times. During first 2 hours of bulk ferment, give dough a turn every half hour. During third hour, turn more gently to avoid degassing. By the end of the third hour, the dough should feel aerated and soft. 20-30% increase in volume. Extend fermentation period if necessary. 6)	Cut dough in half, shape into a boule. 7)	Bench rest 30 min. 8)	Final shaping. Flip so underside is on top. Fold third up and over middle third. Stretch dough horizontally to the right and fold thid right third over the center. Stretch dough left and fold left third over centre. Stretch top third over centre. Stretch bottom third over centre. Shape boule. 9)	Make a 50/50 mixture of rice flour and white flour. Line banneton with it. Place dough into banneton, final rise 3-4 hours. 10)	Preheat oven at 500 with dutch oven inside. 11)	Dust surface of dough with rice flour mixture. Carefully place loaf in dutch oven. 12)	Score with a simple square 13)	Cover and place in oven. Reduce heat to 450, bake 20 min. 14)	Remove lid. Colour of crust should be pale and shiny. Continue to bake until deeply caramelized, 20-25 min. Olive Country Bread 88 Basic country bread, 3 c pitted olives, 2 c walnuts or hazelnuts, toasted and coarsely chopped, 2 t dried herbes de provence, grated zest of 1 lemon Add mix-ins after giving the dough a first turn in bulk fermentation stage. Sesame Country Bread 90 Basic country bread, 1 c unhulled sesame seeds toasted. Add seeds and a little water after giving the dough a first turn in bulk fermentation stage. Walnut Country Bread 91 Basic country bread, 3 c walnuts toasted and broken in half or coarsely chopped, 2T walnut oil. Add walnuts and oil after giving the dough a second turn in bulk fermentation stage. 4 c soft summer berries, 2/3 c sugar, 8-10 slices brioche, 1 c cream lightly whipped, 1 t confec sugar. combine berries, sugar cook 1 min, remove from heat. combine with bread and place in mould. reserve 2 T juice for serving. weigh down, refrig overnight. unmould onto cutting board, spoon out into bowls, serve with whipped cream, reserved berry juice and confec sugar. orange syrup: 1/4 c ea water and sugar, 1 t orange blossom water, 1/4 c orange juice, zest of 1 orange, 2 T orange liqueur. combine all but liqueur simmer on med-high until sugar dissolved, add liqueur off heat, cool. almond cream: 1 c sliced almonds, 1/2 c sugar, pinch salt, 2 eggs, 1/2 c butter, 2 T brandy. combine almonds, sugar, salt in food processor until finely ground. add eggs and butter, process to form a paste. refrig at least 1 hr and up to 3 days. toasted brioche soaked with orange syrup, spread with jam and almond cream, topped with sliced almonds and baked. 6 slices brioche each 1/2 in thick, toasted, orange syrup, almond cream, 1/4 c orange marmalade, apricot jam or berry jam, 3/4 c sliced almonds, confec sugar. 400 oven. arrange brioche on baking sheet, soak brioche with syrup until very moist, spread with jam or marmalade about 1/8 in thick, follow with a layer of almond cream about 1/4 in thick. top with sliced almonds, bake at 400 15-20 min until almond cream caramelized and almond slices toasted. dust w confec sugar before serving. babas and assembly: 4 x 80g brioche dough. at least 3 hours before serving, roll each into a cylinder and connect ends to form a crown. place each in a buttered savarin or ring mould. arrange on a baking sheet and rise 2 hours. bake at 375 until golden brown, 20 min. unmold and let cool. soak in rum syrup at least 10 min until thoroughly saturated. remove and arrange in bowls, spoon ricotta filling into centers. surrounds with necaterines and poaching liquid. garnihs with candied pistachios and dust with confec sugar. poaching liquid and rum soaker: 1 bottle prosecco, 1 c sugar, 1 vanilla bean, 1 c dark rum. boil prosecco and sugar, add vanilla bean, simmer 5 min, pour all but 1 c of liquid into a bowl, add rum. this is rum soaker. remaining 1 c sweetened prosecco is for poaching nectarines. poached nectarines: 3 ripe nectarines in wedges. poach in poaching liquid 3-5 min. candied pistachios: 1 c raw pistachios, 1 c sugar, 1/8 t salt, 1/4 c water. combine sugar, salt, water in saucepan, boil until 320 and light amber, add pistachios off heat, spread on baking sheet and cool. separate pistachios and cool completely. ricotta filling: 2 c whole milk ricotta, 1/2 c dried currants, grated zest and juice of 1 orange, 1/2 t vanilla ex, 1/4 c sugar. combine all. 5 lb boneless pork shoulder, 1 t salt. stuffing: 1 bunch parsley, 12 sage leaves, 1 T rosemary, 2T thyme, 1 c fennel tops chopped, 1/4 t peperoncino, 1 T fennel seeds, 5 cloves garlic, 2 t salt, 4 slices day-old country bread, 3 T olive oil. butterfly pork shoulder to an even thickness of 1 in. season w salt. 220 oven. process all stuffing ingredients, spread on pork. roll up meat and tie with twine. wrap in foil. bake 8-10 hours. cool, then refrig in foil at least 2 hrs. remove foil, cut into 1 in thick slices. brown slices in olive oil before serving. custard base: 3 eggs, 2T sugar, zest of 1 lemon, 1/2 t vanilla ex, 1/4 t salt, 1 c milk. combine. 2 slices country bread at least 1 1/2 in thick. soak in custard at least 1 hr. 350 oven. cook bread in butter about 3 min. occasionally pressing down. preps bread for receiving more custard. spoon more custard into centre of each bread slice. continue cooking 1 min, pressing slightly to seal. when slices are full, transfer skillet to oven. don't turn the bread. bake 12-15 min and then gently shake the pan. keep baking until custard is set. could take up to 20 min. done when custard seems solid and each slice appears inflated. serve with maple-glazed bacon and spread with hachiya persimmon. 4 c leaven at 47, 2 T poolish at 128, 2 c whole milk, 1 1/4 c ap flour, 1 1/4 c pastry flour, 2/3 c cornstarch, 7T sugar, 1 T salt, 1/2 c melted butter plus more for brushing, 6 eggs separated, 3 T vanilla ex. warm milk to just warm. stir into leaven and poolish. sift flours and cornstarch, stir in 5 T sugar and salt. add 1/2 c melted butter and yolks to milk. combine with dry. ferment 3-5 hours. just before making, beat egg whites, with 2 T sugar to med peaks, add vanilla to batter, fold in the egg whites. cook in buttered waffle iron. coconut ice cream, cinnamon-brown butter bread crumbs, cajeta, espresso. coconut ice cream: 1 1/4 c shredded unsweetened coconut, 4 c cream, 2 c milk, 2 young fresh coconuts, 9 yolks, 1 1/3 c sugar, 1 T dark rum, 1 t salt. toast coconut in 300 degree oven. combine cream and milk, simmer, stir in toasted coconut, infuse 45 min then strain. return cream to saucepan. crack coconuts. save coconut water for another use. scrape out flesh, chop roughly. whisk yolks and sugar. make custard. strain, stir in rum, salt and chopped coconut. refrig overnight. assembly: fold bread crumbs and cajeta into frozen coconut ice cream. affogato with espresso. cinnamon-brown butter bread crumbs: 2 slices day-old country bread 1 in thick, 3 T butter, 1/2 c sugar, 1 t ground cinnamon, 1/8 t salt. cut off crust of bread, tear into small pieces, melt butter to brown, add bread and sugar off heat, add cinnamon and salt, bake until caramelized in 350 oven 20-30 min. cool and then store in the freezer. cherry tomato jam: 6 oz spanish chorizo finely chopped, 1 shallot finely chopped, 1 lb cherry tomatoes, 1 t ea marjoram and thyme, 1/2 c dried currants soaked 5 min and roughly chopped, 2 t sherry vinegar, 1/2 t packed brown sugar, 1/4 t salt. cook chorizo until it releases some fat, add shallot and cook to softened, add cherry tomatoes and cook until they pop, reduce heat to med, add herbs and currants until liquid evaporated and jam is thick, add vinegar, sugar, salt. quick aioli: 1 c mayo, 3 T olive oil, 1 clove garlic crushed, zest and juice of 1 lemon. combine. quick pickles: 1 cucumber 1/8 in thick slices, 2 t salt, 3T dill chopped, 1 c rice wine vinegar, 1/2 c water. toss all and sit about 30 min. fries: 2 lb russet or kennebec potatoes unpeeled, 4 c olive or peanut oil, salt and pepper, sage and marjoram. cut potatoes into 1/8 in by 1/2 in. soak 15 min to 1 hr. drain. oil to 375. fry to golden brown about 3 min. fry sage and marjoram, toss with potatoes and salt. assembly: grill buns with butter, top with hamburger, tomato jam, aioli, avocado, little gem lettuce, serve with quick pickles and fries. brioche buns: 6 x 115g brioche dough, 2 yolks mixed with 1 T cream, 1 T poppy seeds, 1 t sesame seeds. form each piece of dough into a bun shape. flatten slightly, let rise 1 1/2 to 2 hrs. 450 oven. brush with egg wash, top with seeds, bake until golden, about 15 min. hamburger patties: 2 1/2 lb ground grass-fed beef at least 20% fat, 1 1/2 t salt, 1/2 t pepper, 8 oz comte cheese sliced. form seasoned meat into patties. grill over charcoal on one side, turn, top with cheese and some caramelized onions, grill. caramelized onions: 2T butter, 2 red onions in 1/4 in thick slices, 1/2 t salt, 1 T sherry vinegar. melt butter, add salt and onions, cook until soft and translucent 10-15. cook until deeply caramelized. add vinegar to deglaze, cool. pate: 6 duck or chicken livers, olive oil, 3 finely chopped shallots, 1 T thyme, 6 T butter room temp, 1/2 c cognac, 1/2 t salt. rinse livers in cold water and remove visible fat and connective tissue. heat oil, sear livers 30 sec. turn, add shallots, sear another 30 min. add thyme, sear a few seconds. remove from heat, pour off fat. add 2T butter and 1/4 c cognac. deglaze, cool 10 min and process with remaining butter and cognac, salt. pour into ramekins. cognac butter: 3 T butter room temp, 1T cognac, pinch salt. heat cognac, stir in butter and salt, pour over pate in ramekins. refrig to set. serve on crostini with jam. stuffing: breadcrumbs made from 4 slices country bread, whole wheat bread or semolina bread, 2 c whole milk ricotta, zest and juice of 1 lemon, 1 t thyme, 1/4t salt. combine. assembly: 2-3 med eggplants, salt, olive oil, 1 c cream, 1/2 c grated asiago. slice eggplant lengthwise into 1/4 in thick slices. should have 12. sprinkle with salt on both sides, drain 1 hr. deep fry in olive oil at 360 until coloured 3-4 min. drain. 425 oven. pour tomato sauce in baking dish. stuff with stuffing and roll up, place on top of sauce. spoon cream over each roll. bake 20-25 min, garnish with asiago. tomato sauce: 1 yellow onion finely chopped, 1 carrot finely chopped, 3 T olive oil, 3 oz tomato paste, 3 garlic cloves finely chopped, 1t peperoncino, 16 oz can tomaotes, red wine vinegar, salt. saute onion and carrot in 2 T olive oil to soft, add remaining oil and tomato paste to deep rusty red. add garlic and peperoncino, cook 2 min, add whole tomatoes, cook on high, boil, simmer 20 min. season with vinegar and salt. 1T butter, whites of 2 leeks finely chopped, 1/2 c white wine, 2 lb mushrooms halved, 1 head treviso radicchio, 2 slices day-old country bread in large chunks, 1/2 c grated gruyere or cheddar. custard: 5 eggs, 1/2 t salt, 1 c ea cream and whole milk, 1/4 t ea pepper and ground nutmeg, 2 t thyme, 2/3 c grated gruyere or cheddar, 3 oz chopped ham. saute leeks in butter, deglaxe w wine. cool. saute mushrooms in olive oil until seared and caramelized, add radicchio. cool. whisk custard ingredients. place breadcrumbs in baking dish, add leeks, mushrooms, and radicchio, pout in custard so that it comes to the rim, sprinkle evenly with the cheese. let stand 10 min so custard can saturate the bread. bake at 375 about 50 min until set. rest 15 min before serving. 6 c rich chicken stock, cooked chickpeas, harissa, charmoula, croutons, 1/2 to 3/4 lb tuna confit at 233 or canned tuna, 1/2 t salt, 4-6 eggs, 3 T cumin toasted and ground for garnish. heat stock on med-high. divide chickpeas, croutons, charmoula and tuna among bowls. poach eggs in salted water. ladle stock into bowls, top with harissa and cumin. chickpeas: 2 lb fresh chickpeas or 1 lb dried, if using dried: 1 t cumin , 1 onion roughly chopped, 2 t salt. if using fresh, simply blanch 2 min and drain. if using dried, simmer in 2 qts water with cumin, onion and salt, boil, simmer 2-3 hours. doesn't say to soak. harissa: 1 gypsy pepper, 4 dried chiles, 1 T cumin seeds, 1 t ea fennel seeds and coriander seeds, 8 garlic cloves chopped, 1/4 t salt, 1/2 c olive oil. roast gypsy pepper, peel. toast dried chiles then spices, pound to fine. add pepper, garlic, salt, pound to a thick paste, heat olive oil until it starts to smoke, add paste off heat. cool in the skillet. Charmoula: 2 shallots finely chopped, zest and juice of 2 lemons, 2 garlic cloves finely chopped, 1 c ea mint and cilantro chopped finely, 1 T coriander seeds toasted and crushed, 3 T cumin seeds toasted and crushed, 1T sweet paprika, 3 serrano chiles finely chopped, 1/2 c olive oil. pulse all to make a rough paste. Sandwich assembly: baguette divided into 4 sections and toasted, 12 slices porchetta, mortadella or headcheese, baker's foie at 265, lime quarters, pickled vegetables, green aioli, garlic fish sauce, basil, cilantro. pickled vegetables: 3 c ea red wine vinegar and water, 1/2 c sugar, 2 T salt, 1 red onion in slices 1/4 in thick, 1 bunch small carrots in matchstick strips, 1 bunch radishes thinly sliced. let stand at least 30 min. green aioli: 1 c basil, 1 c cilantro, 2 c quick aioli at 261 or mayo plus 3 cloves garlic, juice of 2 limes, 1 jalapeno or serrano chile minced, 1 t salt. blend. garlic fish sauce: 4 cloves garlic, juice and pulp from 3 limes, 1 t chile oil, 2 T vietnamese fish sauce. make just before serving. pound garlic, add lime juice and pulp, stir in chile oil and fish sauce. 6T butter, 2 leek whites finely chopped, 6 c whole milk, 4 slices stale country bread, 1 lb butternut squash 1/4 in slices, 1 bunch tuscan kale, 1 head cauliflower in 1/2 in slices, 1/2 lb fontina thinly sliced, cream. 375 oven. melt 1 T butter, saute leeks 5 min, add 2 c milk, remaining butter, 2 t salt, boil then remove from het. cover bottom of heavy pot with 2 slices bread, top with squash, 2 c milk mixture, top with 2 slices bread, kale, cauliflower, press down. pour remaining 4 c milk mixture. stop adding milk when level almost to the rim. season, cover with lid or foil, bake 10 min, uncover, top with cheese, bake until liquid absorbed and reduced and cheese browned, about 20 min. 3 T olive oil, 8 oz nettles, croutons from 3 slices country bread crushed to make coarse breadcrumbs, 1 egg, 1 1/2 c tomato sauce at 255, salt and pepper, 1 lemon wedge. heat 1 T olive oil, add nettle, remove from heat, toss nettles for 2 min until completely wilted, chop roughly. combine with breadcrumbs and egg. heat remaining 2T olive oil, add nettle mixture, cook until edges appear crisp 2 min, fold over and cook 30 sec. serve with tomato sauce and a squeeze of lemon. tapenade: 2 c nicoise olives pitted chopped, zest and juice of 1 lemon, 1 t thyme, 1/4 t chile flakes, 6-8 oil-cured anchovies, 2 cloves garlic chopped, 2 T capers chopped, 1 t sherry vinegar, 2 T olive oil: process all to a coarse paste, moisten to taste w olive oil. to assemble, spread tapenade on baguette, top with slaked tuna, peppers, lemon slices, capers, generous amount of arugula. wrap tightly in parchment, then in plastic wrap, weigh down and let stand at least 1 hr. Assembly of sandwich: country bread of baguette, meatballs, pesto spread, tomato sauce, 8 oz sliced provolone. preheat oven to 350. spread top half of loaf with pesto spread, spoon meatballs and sauce over bottom, top with provolone, then top half of loaf, loosely wrap in foil, bake until cheese has melted and bread is crispy about 25 min. Pesto spread: 1/4 c finely chopped garlic, all finely chopped: 1/4 c parsley, 1/4 c basil, 1/2 c arugula, 1/4 c crushed pine nuts, 3 T olive oil, 2T parmesan, 2t lemon juice, 1/4t salt. process all. Meatballs: 2 T olive oil, 1 chopped large white onion, 1 lb ground beef at least 20% fat, 1 lb ground pork, 4 eggs, 1 c whole milk, 1 c grated pecorino, 1/4 c red wine, 2 c breadcrumbs, 1 bunch parsley chopped, 1 1/2 t salt, 1/2 t pepper, 1/4 t peperoncino. saute onions in oil, cool. combine all and form into small balls the size of apricots. brown in olive oil. tomato sauce: 28 oz can chopped tomatoes, 3 cloves garlic chopped. drain fat from skillet, add garlic, then tomatoes, deglaze, simmer meatballs in sauce 20 min. Caesar Dressing 218 Zest of 1 lemon, pound with 3 cloves garlic, 6 anchovies. Add egg yolk and salt. Add a squeeze of lemon juice, pour in 1/2 c olive oil slowly, slowly add 1 1/2 more cups oil holding emulsion, season with lemon juice to taste. Serve on romaine with croutons and parmesan. Chilled Chicken Consomme with Soldiers 223 Rich chicken stock: 2 T olive oil, 1 onion roughly chopped, 3 carrots peeled and chopped, 2 stalks celery chopped, 1 chicken, 6 chicken feet, 4 chicken legs, 6 sprigs thyme, 1 bay leaf, 1/4 t salt, 4 lit water, make stock, cool, chill in a dish to a depth or 1/2 to 1 in. Fry country bread in olive oil, cut into 1/2 in wide soldiers. Cut consommé into 1/2 to 1 in cubes, serve in bowls with soldiers. Sopa de Ajo 228 1 qt rich chicken stock, 3T olive oil, 1 head garlic roughly chopped, 1/2 c white wine, 2 t paprika, croutons, 4-6 egg yolks Simmer stock, sauté garlic in olive oil until light golden brown, add wine to evaporated, add paprika., add croutons, when well coated pour in the hot stock. Simmer 2 min. Top with egg yolks and parsley. Pickled Sardines on Crostini with Herb Salad 209 12 fresh sardines, 1/2 red onion in 1/4 in slices, zest and juice of 3 lemons, 1/2 c sugar, 1 T salt, 1 c olive oil, 1 orange cut crosswise into 1/8 in thick, 1/4 c marjoram leaves Vinaigrette: 2 T olive oil, 2 t champagne vinegar, 1/2 t chopped shallot, salt and pepper Herb salad: 1 c argugula, 1/4 c ea parley, cilantro, basil, chervil, fennel tops, purslane, sunflower petals, country bread slices fried in olive oil. Fillet the sardines, marinate onions in lemon 5 min, stir in sugar, salt and olive oil, layer half sardines, orange and marjoram, pour half marinade, repeat. Keeps up to 1 week. Toss herb salad in vinaigrette, serve on crostini with sardines. Can also serve with mashed avocado and chile sauce. Fresh Fava Panzanella 181 1 red onion 1/4 in slices macerated in 1/2 c red wine vinegar and water to cover 30 min 4 lb fava beans, shelled, croutons made from 4 slices country bread, 1 bunch mint Lemon vinaigrette: zest and juice of 2 lemons, 1t sugar, 1 c olive oil, 1/4 t salt Blanch favas 1 min, then shock, peel. Toss all (drain onions), let stand 1 min before serving. Tomato (and Artichoke) Panzanella 183 Roasted artichoke croutons: red wine vinegar or sherry vinegar, 2 lb baby artichokes, 6T olive oil, 4 thick slices country bread torn in large pieces, 4 oz parmesan Tomato vinaigrette: 4 heirloom tomatoes, 1/2 red onion finely diced, 3T red wine vinegar or sherry vinegar, 1/4 t salt, 1 c olive oil 1 english cucumber, 1 bunch basil Prepare artichokes, place in acidulated water, drain, toss with 3 T olive oil and salt, place bread on top, grate cheese over all, roast at 400 until artichokes crispy outside, tender inside, bread deep golden brown, 15-20 min. Halve tomatoes and squeexe, add remaining, peeled cucumber in strips, toss all. Escalivada 187 – grilled veg and bread with anchoiade 1 large rosa Bianca or globe eggplant 1/4 in slices lengthwise, 1 zucchini 1/4 in slices lengthwise, 6 gypsy peppers halved and seeded, 1 red or yellow onion 1/4 in slices, 1/2 c olive oil, 4 slices country bread Anchoiade: 2 cloves garlic, 6 olive oil packed anchovy fillets, 1/2 c walnuts, 1/2 t coriander seeds, grated zest and juice of 1 lemon, 1/2 c olive oil, 1 T marjoram, 1 t thyme, 1/2 c dried or dark black mission figs, 2 ripe tomatoes in 1 in chunks, 2 c mixed parsley and basil, optional 8-10 fresh figs halved Brush veg with olive oil, grill on charcoal until slightly charred 6-8 min total. Brush bread with olive oil, grill until slightly charred. Cut each slice in half. Anchoiade: pound garlic and anchovies, add walnuts and coriander and pound to a paste. Stir in remaining. Season. Arrange tomatoes, bread, parsley, basil, grilled veg and figs on a platter. Spoon anchoiade over. Bagnet Vert 189 – related to salsa verde Marinated anchovies: 1 T coriander seeds, two 2-oz cans anchovies packed in olive oil, zest of 1 lemon, peperoncino, 1/2 c olive oil, optional cilantro blossoms for garnish Bagnet vert: 2 c torn day-old country bread, 1T red wine or sherry vinegar, 1/2 c water, 2 c parsley, 1 c olive oil, 1 T capers, 4 olive-oil packed anchovy fillets, 1/2 t salt, cilantro blossoms Toast coriander seeds, coarsely crack, arrange anchovy fillets on a plater, sprinkle with lemon zest, coriander seeds and peperoncino. Cover with olive oil, marinate 4-8 hours. Bagnet vert: toss bread with vinegar and water. Soften 5-10 min. Transfer bread to blender and blend with remaining. Spoon on plates and arrange marinated anchovies over top. Garnish with cilantro blossoms. Aioli 196 A clove garlic, zest and juice of 1 lemon, 1/4 t salt, 1 egg yolk, 1 c olive oil, 1 slice day-old bread Pound garlic, lemon zest and salt. Add yolk and 1/2 t lemon juice, stir vigorously, then add olive oil drop by drop in emulsion. Flavour with remaining lemon juice as needed, pound bread to a smooth paste with lemon juice or water. Combine with aioli. poolish: 200g ap flour, 200g water 75F, 3g active dry yeast. stand 3-4 hours or overnight in refrig. leaven: 1T mature starter, 220g ap flour, 220g water 80F. feed. ready when poolish and starter pass float test. for 14-16 croissants: 450g whole milk room temp, 300g leaven, 400g poolish, 1kg bread flour, 28g salt, 85g sugar, 10g active dry yeast, 400g cold butter. combine milk with leaven and poolish. add flour, salt, sugar, yeast. mix thoroughly, rest 25-40 min. bulk ferment 1 1/2 hours, turn every 30 min. flatten into a rectangle in a plastic bag, chill in refrig 2-3 hours. cut cold butter into cubes, pound, incorporate 1/2 c ap flour into it. goal to make it pliable without warming it. mould into an 8x12 in rectangle. keep cool but don't let it chill to the point of no longer being pliable. roll doug into a 12x20 in rectangle. place butter in centre. fold right and left over dough. immediately turn 90 degrees and roll it again into a rectangle 12x20 in. do letter fold again. this is the first turn. refrig 1 hr. if refrig longer, let it warm again for 15 min before next turn. complete two more turns. after third turn, will have a rectangle 8x12, 2 in thick. wrap in plastic and chill in freezer at least 1-2 hours. can store in freezer 2-3 days, but transfer to refrig the night before plan to bake the dough. shaping: roll to 18x24, 1/2 in thick. cut in half to create two long rectangles 9x24. cut ea into 6-8 rectangles. roll up triangle beginning wide side. place on baking sheet, rise 2 hours. ready to bake when 50% larger than original size. firm but puffed up. can also shape in the evening, refrig overnight - retarded rise. let them puff slightly at room temp before baking. brush with egg wash 2 yolks 1 t cream. bake 425 about 30 min. bulk ferment 2 hours in a cool place, two turns in the first hour, one turn in the second hour. just before shaping the dough, butter moulds. cut dough into 4 to 6 equal pieces, shape each into a loaf. proof in moulds 1 1/2 to 2 hours. 450 oven. brush with egg wash (2 large egg yolks and 1 t cream), bake 35-40 min. for 4 to 6 loaves. dough: 400g poolish, 300g leaven, 1kg bread flour, 25g salt, 15g active dry yeast, 500g eggs, 240g whole milk, 150g honey, 50g orange blossom water, 450g olive oil. combine dry in mixer bowl. add eggs, milk, leaven, poolish, honey, orange blossom water mix with dough hook on low until combined 3-5 min. rest 15-20 min. mix on med-high until it releases sides, 6-8 min. on med speed add olive oil to the middle where dough hook meets dough. continue until all butter incorporated, silky smooth and homogenous. 200g brioche dough. shape about 2 hours before serving. flour dough and work surface, roll into a cylinder about 1/2 in in diameter, rise 1-2 hours. heat frying oil to 375. cut dough on the diagonal into pieces 2 in long, fry until golden about 1 min. when cool enough to handle, dip in lemon glaze and then coat in candied pecans. lemon glaze: 2/3 c lemon juice, zest of 3 lemons, 1 c granulated sugar, 1/2 c powdered sugar. simply combine all. maple pecans: 2 T ea maple syrup, corn syrup, sugar, 1/8t salt, 2 c pecans. 400 oven. 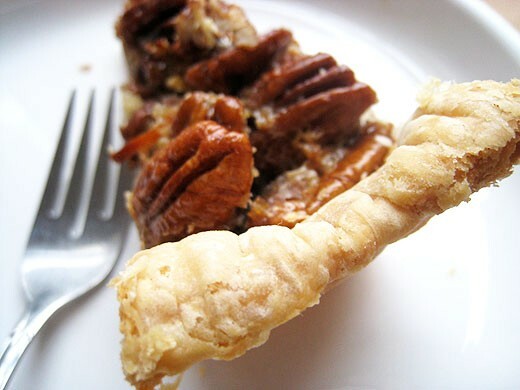 stir together all but pecans, toss in pecans, spread in an even layer on baking sheet and bake at 400 until glaze begins to bubble. stir every few minutes. continue to bake until glaze has thickened and the bubbles have slowed down, about 15 min. cool completely and finely chop. 2 lb brioche dough before bulk ferment, 8 oz bacon lardons, 1/4 c toasted hazelnuts chopped, 1 small bunch thyme, zest of 1 orange, 1 t pepper. combine all but butter. follow instructions for brioche bulk ferment, butter 4 tall ring moulds 4 in in diameter, divide dough into 4, form each into a round and rise in mould 1 1/2 to 2 hours, bake at 425, 35-40 min. 2 lb brioche dough pre- bulk ferment, 1/2 c dried currants soaked overnight in 1 c schnapps, marc or grappa, 1 c dried apricots chopped, 3/4 c pistachios toasted, 1/2 t ground cardamom, 1 T orange blossom water, 1/2 c melted butter, 12 almonds, 1/4 c confec sugar. combine soaked currants, apricots, pistachios, cardamom, orange blossom water. mix with brioche dough. bulk ferment as for brioche. brush kugelholf mould with melted butter, place an almond in each top crease, make a hole in the center of the dough and place in mould seam-side up. rise 1 1/2 to 2 hours. bake 35-40 min at 425. brush with melted butter while still warm. dust with confec sugar, brush with currant soaking liquor. dust with confec sugar before serving. baguette dough. bulk ferment 3-4 hours, giving one or two light turns. dust kitchen towel with mix of rice and ap flour. turn dough onto towel, rest 10 min. dust top w flour mix. press dough from the middle outward until it is 1/4 to 1 in thick. evenness more important than thickness. refrig to rise overnight. remove from refrig 30 min before cooking. cut into 3-in rounds. griddle in clarified butter after 2 min they will puff 2 in high. turn when bottoms golden, press them lightly so they lay flat. cook until other side golden, 2-3 min more. dust with cornmeal. to serve, cool slightly and split with a fork, serve with butter and jam. for 4 to 6 loaves. poolish: 200g ap flour, 200g water 75F, 1g active dry yeast. mix and let stand 3-4 hours at warm room temp or overnight in refrig. leaven: 1T mature starter, 220g ap flour, 220g water 80F. feed starter. leaven and starter ready when they pass the float test. dough. 1kg bread flour, 25g salt, 120g sugar, 10g active dry yeast, 500g eggs, 240g whole milk, 300g leaven, 400g poolish, 450g butter softened 30 min. combine dry in mixer bowl. add eggs, milk, leaven, poolish mix with fdough ook on low until combined 3-5 min. rest 15-20 min. mix on med-high until it releases sides, 6-8 min. cut butter in 1/2 in pieces, should be soft and pliable but still cool and not melted. on med speed add one at a time to the middle where dough hook meets dough. continue until all butter incorporated with no visible bits of butter. Raisin and Coriander Whole Wheat Country Bread 116 1 c raisins soaked 10 min, 1 T toasted coriander seeds ground. Add after second turn. Whole Wheat Pain au Gruyere 117 Whole wheat country bread, 10 oz grated aged gruyere, olive oil Add cheese to dough after flour is added during mixing stage. Rest 40-60 min. Brush with olive oil before baking. Country Rye 118 200g leaven, 800g water, 170g whole rye flour, 830g bread flour, 20g salt First rest 40-60 min. baguette dough. after bulk fermentation, divide douh and let rest as directed. then, working with one rectangle at a time, fold the third closest to you up and over middle third. holding ends stretch slightly. fold right third over middle, then left third over middle, then third farthest to middle. press down to develop tension. roll dough towards you, with each successive roll press with outer edge of palms and fingers to further develop tension. should end up with slightly rectangular cylinder with seam facing down. flip onto a flour-dusted kitchen towel so seam faces up. press out to 1/2 in thick. let rise 2-3 hours. transfer to pizza peel. make a pattern of cuts in the dough, stretch to create openings. bake as for baguettes. Grain Country Bread 93 Basic country bread, 1 c grain, thoroughly cooked or soaked in boiling water, then cooled. 1 c pumpkin or other seeds toasted, 3T complementary oil, 1T chopped herbs Add all to dough after second turn with a little water. Potato Focaccia 101 Basic country bread, 3 lb Yukon gold potatoes sliced thinly with mandolin, 1 1/2 t salt, pepper, 1/2 c olive oil, leaves from 1 bunch thyme, 3 oz shaved pecorino Shape dough for step 6. Toss potatoes with salt and drain, squeeze moisture out. Toss with pepper, olive oil and half the thyme. Dough on baking sheet, stretch to the edges, distribute potatoes over, bake 15 min at 500. Bake 15 min, rotate, continue baking until golden and potatoes crisp, 20 min. Top with pecorino and remaining thyme. Semolina Bread 110 200g leaven, 750g plus 50g water 80F, 700g semolina flour, 300g ap or bread flour, 75g fennel seeds toasted, 75g sesame seeds toasted, 75g poppy seeds, 20g salt, 200g mixed seeds for coating (sesame, poppy and fennel untoasted) Add seeds after second turn. Roll loaf into topping seeds after final shaping. Golden Raisin, Fennel Seed and Orange Zest Semolina Bread 112 3 c golden raisins soaked in warm water 30 min, 1 1/2 T fennel seeds toasted and crushed, 1 t coriander seeds toasted and crushed, grated zest of 1 valencia orange Add mix-ins after second turn with a bit of raisin water. This is my go-to pastry creme recipe. Two of the most gorgeous, celebrated, and bestselling baking books of the past five years, from San Francisco’s beloved Tartine Bakery, are presented together for the first time. 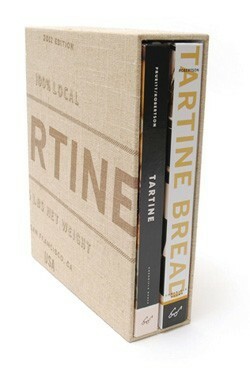 A richly textured slipcase that captures the rustic elegance of a baker’s apron features both Tartine and Tartine Bread. Including recipes for luscious pastries, unforgettable desserts, and inimitable breads, and awash in award-winning photography, there is no better gift for baking enthusiasts than Tartine: The Boxed Set.